The financial crisis of 2008 had an interesting collateral benefit for many emerging economies. Developed countries like Germany/ France/ USA etc. have begun to look at closely the illicit tax avoided funds kept by their citizens in various tax havens. This is because there was a clamor among their citizens about black money kept abroad by the rich when the economy was having major unemployment and recession etc. As early as February 2008- German authorities have collected information about illegal money kept by citizens of various countries in the Lichtenstein bank and the German Finance Minister offered to provide the names to any Government interested in the list. The UPA1 (United Progressive Alliance) Government unfortunately did not act for many months and after much prodding by opposition, asked for the list in late 2008. Germany’s intelligence agency seems to have paid an unnamed informer more than $6 million for confidential and secret data about clients of LGT group a bank owned by the Liechtenstein Prince’s family. The revelations have already led to the resignation of the head of Deutsche Post which is currently the world’s largest logistics company in the world. The Lichtenstein leaders were furious and have focused all their ire at the theft of the data rather than on the facts of the case. The German Government has announced that it would share information on accounts held in the tax haven with any Government that wanted it. They had a list of 1400 clients of whom only 600 were Germans. The spokesman for the German Finance ministry Thorstein Albig had indicated [March 2008] that they would respond to requests without charging any fees for the information. Finland, Sweden, and Norway have got the data. This is perhaps the first time a sovereign Government stole data from a bank of a tax haven to expose tax evaders. There are in all more than 70 tax havens and we will elaborate on these later. Similarly France purchased stolen data from HSBC (Hong Kong Shanghai Bank Corporation) Geneva branch. Additionally, US was waging a running battle with UBS (Union Bank of Switzerland) about the illicit funds kept by its citizens in the Swiss bank. These illustrations show how the economic crisis of 2008 was a catalyst for going after tax havens by developed economies. What is the Size of the problem globally? The estimates pertain to total amount hoarded in these Tax havens on a global basis and that of Individual countries including India. Then there are estimates of India’s illicit money in Switzerland since that country has been a long time favorite of Indians.
. He should know better but there are different types of estimates which are inferred and available about the nature of the problem. 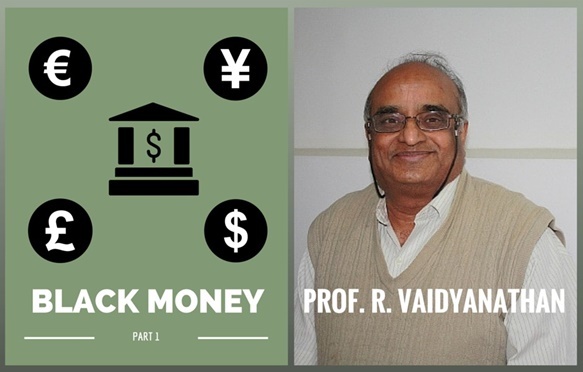 Of course by definition it is black money and so it will be difficult to have an exact estimate regarding the same. Measuring the size of the offshore economy is an exercise in night vision. It is hard to define it; it is fragmented and messy, and it is swathed in secrecy. Official international efforts to measure the various aspects of the phenomenon have been inadequate. We are concerned above with financial flows that are harmful and abusive, whether or not illegality is involved. So we are concerned with tax avoidance, for example, as well as with phenomena such as tax competition. Mostly individual countries’ data is analyzed for “trade mis-pricing” as a major source of generation of illicit funds. This mechanism and implications we will discuss later. Listed below are some of the Global estimates followed by other regional estimates. – excluding Switzerland, China, Taiwan and Oil exporting economies — at $18 trillion; and that is still an underestimate, says IMF. The study reports that there may be as much as $18 trillion of foreign dollars parked in small international financial centers, which does not include Switzerland. This does not exhaust the world economies, particularly those economies, which generate lots of export and cash surplus. Leading, cash-rich economies such as China, Taiwan and many of the oil-exporting countries do not participate in the IMF’s survey. This is only for what are called Small International Financial Centers numbering 32. The latest available IMF figures show portfolio assets held by foreigners in Luxembourg to be worth $1.5 trillion at the end of 2008. But looking at statistics provided by the Luxembourg Government on portfolio investment liabilities for the country – the mirror image of the asset information held by the IMF – there is a big discrepancy. The investment liabilities in Luxembourg were $2.5 trillion – $1 trillion (€726bn) more than the assets reported. “I admit I can’t resist the temptation to say that some of us have been saying this for a long time. The Tax Justice Network wrote on this in 2005, suggesting there were £11.5 trillion of assets offshore. Time and again this has been attacked by organizations that should have known better and by academics with a right wing axe to grind. But now, like so much else I and others have argued, it is being validated. And the issue itself, once dismissed as inconsequential is now being considered seriously. Christian Aid’s False Profits: robbing the poor to keep the rich tax-free estimates that between 2005 and 2007, the total amount of capital flow from bilateral trade mis-pricing into the EU and the US alone from non-EU countries is estimated conservatively at more than US$1.1 trillion (£581.4 billion, €850.1 billion)- Update: March 2009. Global super rich has at least $21 trillion hidden in secret tax havens. At least $21 trillion of unreported private financial wealth was owned by wealthy individuals via tax havens at the end of 2010. This sum is equivalent to the size of the United States and Japanese economies combined. There may be as much as $32 trillion of hidden financial assets held offshore by high net worth individuals (HNWIs), according to this Report. We consider these numbers to be conservative. This is only financial wealth and excludes a welter of real estates, yachts and other non-financial assets owned via offshore structures. December 11, 2013 Illicit Financial Flows from Developing Countries: 2001-2010 – Global Financial Integrity, Dec 2013. Estimating that the developing world lost from 2002 to 2011 developing countries lost US$5.9 trillion to illicit outflows, and $954 billion in 2011 alone. May 22, 2013 Oxfam: At least $18.5 trillion is hidden by wealthy individuals in tax havens worldwide. Original here. July 2012 Inequality: You don’t know the half of it: TJN’s assessment of why inequality is much worse than we think, because of offshore secrecy. November 2011 A Tax Research briefing paper on the $3.1 trillion annual costs of tax evasion worldwide. With country by country breakdown. Original here. March 2010 New IMF research showing huge discrepancies between portfolio assets and liabilities in selected offshore centres. For instance Luxembourg reports portfolio assets of US$1.5 trillion at end-2008 versus portfolio investment liabilities at US$2.5 trillion. The Cayman Islands reports a $750 billion: $2.2 trillion assets-liability split. Click here for more. February 2010 Global Financial Integrity estimate that developing countries lose $98 – $106 billion each year due solely to re-invoicing. May 29, 2013 Illicit Financial Flows from Africa, 1980-2009. Global Financial Integrity. Between 1980 and 2009, the economies of Africa lost between US$597 billion and US$1.4 trillion in net resource transfers away from the continent. Original here. May 24, 2013 Action aid: Almost half of all investment into developing countries goes through tax havens. Original here. October 2012 Over $800 billion drained from Sub Saharan Africa. Original here. October 2012 Over $450 billion drained from North Africa. March 2009 False Profits: robbing the poor to keep the rich tax-free, Christian Aid. Between 2005 and 2007, total capital flow from bilateral trade mispricing into the EU and the US alone from non-EU countries is more than US$1.1 tn (£581.4 bn, €850.1 bn). May 2008 Death and Taxes: the true toll of tax dodging, Christian Aid. Estimates corporate tax losses to the developing world at US$160bn a year (£80bn), more than one-and-a-half times the combined aid budgets of the whole rich world.